The Apache trout, Oncorhynchus apache, is a species of freshwater fish in the salmon family (family Salmonidae) of order Salmoniformes. It is one of the Pacific trouts. The Apache trout measures in length from 6 to 24 in (15–61 cm), and weighs between 0.4 to 6 lb (0.2–2.7 kg). [ citation needed] It rarely exceeds 10 in (25 cm), but can reach up to 16 in (40 cm) in its native, headwater streams. Apache trout are a yellowish-gold color with a golden belly and have medium-sized dark spots that are evenly spaced and that may extend below the lateral line and onto the dorsal and tail fins. The top of its head and back are dark olive in color, and it has the appearance of having a black stripe/mask through each of its eyes, due to two small black dots on either side of the pupil. There can be a throat mark below the lower jaw, ranging in color from yellow to gold. The Apache trout is the state fish of Arizona, and is one of only two species of trout native to that state, with the other being the gila trout (O. g. gilae). It natively lives in clear, cool streams in the White Mountains that flow through coniferous forests and marshes, but has been introduced into several lakes in the area. The Apache trout is native to the upper Salt River watershed ( Black and White rivers) and the upper Little Colorado River watershed. Apache trout have been introduced into isolated streams outside of their historic range in the Pinaleno Mountains and the North Rim of the Grand Canyon. The Apache trout spawns from March to the middle of June, and varies with elevations. Maturity was found to occur in three years, and fecundity is based on the size of trout. One female typically produces from 72 to 240 eggs in 13.1 to 19.1 cm (5.2 to 7.5 in) fish and from 646 to 1,083 eggs in 29.8 to 34.9 cm (11.7 to 13.7 in) fish. The eggs hatch after 30 days. The Apache trout eats both terrestrial and aquatic insects, such as Trichoptera and Diptera. In lakes, they also eat small fishes and zooplankton. While the IUCN considers the Apache trout to be critically endangered, it is listed as threatened under the Endangered Species Act. Around 100 years ago, they could be found in 600 miles (970 km) of streams in the White Mountains. By the late 1960s, their range had been reduced to around 30 miles (48 km) of these streams. Once the Endangered Species Act of 1969 was passed, they became one of the first species listed under it. When this act was replaced by the Endangered Species Act of 1973, they became one of the first fish species protected under the newer Act. Population numbers for this species are still rising. Today, the main risk to the Apache trout is its easy hybridization with the rainbow trout and major forest fires. Cutthroat trout are also genetically similar and cross-breed with Apache trout, compromising the genetic purity of each species. The range of the Apache trout remains limited, which puts it at risk, but it is now common enough that limited fishing is permitted. ^ Rinne, J.N. 1990. 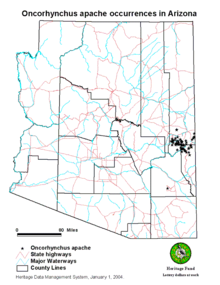 Status, distribution, biology, and conservation of two rare southwestern (U.S.A.) salmonids, the Apache trout, Oncorhynchus apache Miller, and the Gila trout, O. gilae Miller. Journal of Fish Biology 37(1990):189-191. "Oncorhynchus gilae apache". Integrated Taxonomic Information System. Retrieved 24 January 2006. Trinomial from Behnke, 2002. Froese, Rainer and Pauly, Daniel, eds. (2012). "Oncorhynchus apache" in FishBase. February 2012 version.